From time to time, a film will end in a way so unexpected and so significant that it profoundly influences its audience's reaction to everything that has come before. In most films, this is achieved by a twist -- letting the audience members in on a secret they could not have known beforehand. But in a few rare and wonderful cases, the revelation is not a "cheat" or "twist; it is a transformation -- a capstone placed on the film that fits so perfectly and wonderfully that is would have been impossible to predict; a moment that is not so much illogical as it is supralogical. 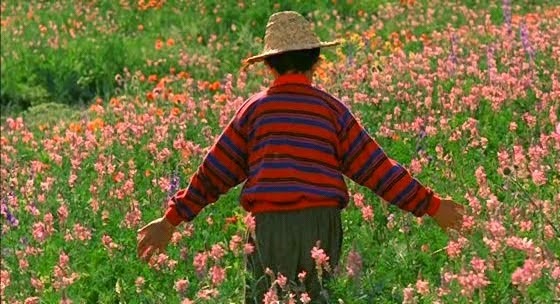 For me, the single most perfect example of such a transformational moment occurs in the last fifteen seconds of Majid Majidi's extraordinary film: The Color of Paradise (Rang-e Khoda). Without those few, all-important final frames, the film is a superbly-made, wrenching story of a young blind boy and his father, battling to survive in the midst of harsh and painful circumstance -- worthwhile for a number of artistic reasons, but not a particularly rare cinematic specimen. With those last few seconds, however, Majidi's work becomes something else altogether: a devastating yet deeply hopeful story of a father's struggles against selfishness, and of a young boy's relentless, all-consuming search for the love and understanding that can only be found in God Himself. In the city of Tehran, the blind boy Mohammad awaits the arrival of his father, Hashem, a widowed coal worker who makes his home in the harsh, beautiful hills of Northern Iran. As the hours pass with no sign of Hashem's arrival, Mohammad amuses himself by exploring the gardens around the school. His innocent, joyful interactions with the plants and animals around him reveal the young boy to be more sensitive and aware of his natural surroundings than many a sighted person. When his father finally appears at the school gates, Mohammad's blindness shields him from the painful fact that Hashem is deeply and bitterly ashamed of his son's handicap. After an unsuccessful attempt to persuade the school's headmaster to accept his son as a full-time resident, the resentful father departs for home with Mohammad by his side. In the weeks following Mohammad's return, he continually amazes those around him with his kindness, gentleness, and joy. Yet to his father, Mohammad is nothing but a burden -- a constant reminder of the many sufferings that have besieged him since his wife's untimely passing. Fearing that his son's blindness disgraces him in the eyes of his fellow villagers, Hashem resolves to take Mohammad away, apprenticing him to a blind carpenter who lives many miles from the village. Our teacher says that God loves the blind more because they can't see, but I told him if it were so, He would not make us blind so that we can't see Him. He answered: "God is not visible. He is everywhere. You can feel Him. You see Him through your fingertips." Now I reach out everywhere for God, searching till the day my hands touch Him and tell him everything, even all the secrets in my heart. Back in the village, Mohammad's father experiences a number of severe setbacks -- tragedy dogging his footsteps at every turn. Finally, a broken man, he sets out to bring Mohammad home. Overjoyed at his father's (begrudging) acceptance, the young boy eagerly accompanies him. Along the way, as the two attempt to cross a treacherous wooden bridge, it collapses, plunging Mohammad into the raging torrents below. In that moment Hashem is confronted with his greatest temptation: here is an opportunity to be released from the very burden under which he has been chafing all these years. Surely, no one could fault him for such a tragic accident, and Mohammad's death would be swift. But in that moment -- a truly transformational moment of grace -- Hashem rejects the selfishness that has motivated so many of his actions, leaping into the water in a desperate attempt to rescue his son. Confronted with the ultimate choice -- either to live for himself, or to pour out his life for another -- he finally embraces the path of self-sacrifice that he has been fleeing his whole life. Tragically, it is too late. Yet, in spite of his deep sorrow, Hashem has been profoundly touched by that moment; he has been saved. And then, everything is transformed. As the devastated father huddles on the riverbank with the body of his lifeless child clutched in his arms, a gentle light begins to shine over them both. The light grows brighter and brighter, casting a supernatural light over the tragic scene. In that brief, shining moment before the screen goes black, Mohammad's hand moves -- not to signal his return to life, but to proclaim his entry into a far greater glory. After a lifetime of suffering, a lifetime of searching, a lifetime of reaching out for God, the young child's hands have finally touched Him. Now, at last, Mohammad can tell Him everything, even the deepest secrets of his heart. Heartbreaking? To be sure. But hopeless? Far from it. The story of Hashem, while sorrowful, is a story of true repentance and conversion. His son may no longer be with him, but the transformational circumstances surrounding his loss will always be felt; it has left a profound mark on Hashem's soul -- a vital signpost along his path to salvation. And yet, despite the profound importance of his tragic parting and the sadness we may feel at witnessing it, it is the story of Mohammad's life that teaches his father (and us) far more than his death ever could. There are few beings who rely so completely on the gift of faith as do the blind. For them, "belief in things unseen" is not simply a means of spiritual growth; it is their very life, affecting them in ways sighted folks can never truly imagine. Yet it is not in his faith that Mohammad puts us most to shame, nor is it through his desire to see God that he most inspires us. Instead, it is his urgent, even desperate need to touch Him; to be with Him; to share with Him always that is the greatest lesson to be learned from his story. It is not simply that Mohammad wishes to believe; it is that he, above all else, beyond anything in his life, wishes to love. We, like Hashem, can too easily forget how essential that call to love truly is, and how completely it transforms everything we see and everyone we touch. We are not called to love Him when convenient, or when moved by our emotions, or when He seems to reciprocate our love in a manner and to a degree we deem appropriate. We are called to love always, and completely -- with our whole hearts, our whole minds, our whole souls. Mohammad, in his world of darkness, is not to be pitied; he sees far more clearly than we ever shall. Attribution(s): Publicity images and movie stills are the property of Sony Picture Classics and other respective production studios and distributors, and are intended for editorial use only.